Your Hocking Hills escape starts here. Nestled in 55 acres of wooded terrain, Crockett’s Run enchants travelers with its secluded lodges and cabins, cozy canvas bell tents, and a stunning wedding, business and event center. Our landscape features huge rock formations, private hiking trails, and a serene pond for fishing and pedal boating. Crockett’s Run is just minutes away from popular Hocking Hills attractions, such as canoeing, golfing, zip lines, horseback riding, craft and antique shopping, and popular state and metro parks. Come and savor nature’s simple joys in comfort and style. The largest lodge on site, this professionally decorated and recently updated lodge has 5 bedrooms and 3 baths with 3,000 sq. ft of living space. It has a breathtaking view of a butterfly-filled meadow and wooded rolling hills. Perfect for a family getaway or a private retreat. Crockett’s Lodge greets you with an evergreen-lined entrance. The iconic A-Frame design exudes simplicity, warmth and comfort. Enjoy an open living area bathed in natural light from floor to ceiling. The Lodge comfortably sleeps up to 20 guests, and the large deck and hot tub share a birds-eye view of our pond and tree-covered hills. 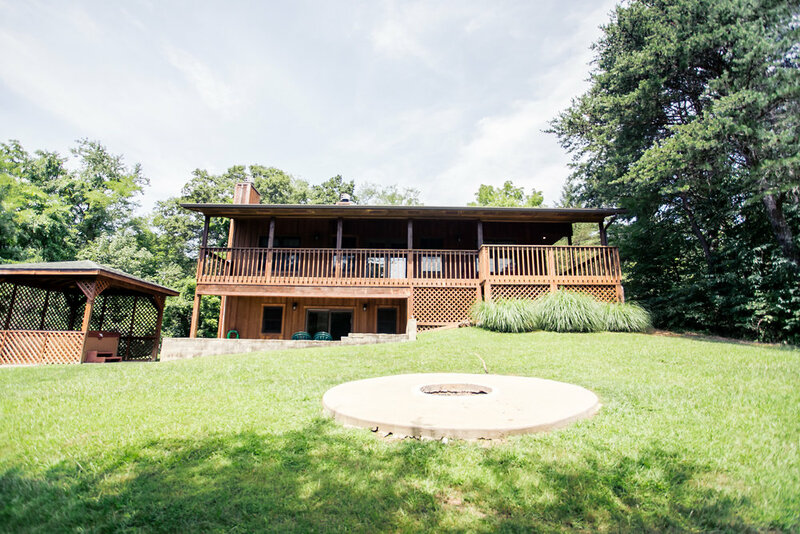 Unwind in the hot tub or relax on the covered deck while taking in the gorgeous views of the hemlock-studded hillside and wildlife grazing in the gorge. This secluded lodge has 5 bedrooms and 3 bathrooms, as well as 2 wood-burning fireplaces. An inviting entertainment room is the perfect spot to relax with friends while playing pool or lounging on a large and comfortable sectional. Travis Lodge offers an open living and dining room area that captures the natural light through expansive windows. The wraparound porch embraces the sweeping views. Relax in the hot tub on the lower deck, or play an exciting game of billiards in the entertainment room. This lodge has 4 bedrooms and 2.5 baths and can accommodate up to 14 guests. Bowie is a cozy cabin that sits on an outcropping of Black Hand sandstone and overlooks the east gorge. The hot tub on the open deck is the perfect place for stargazing. Boasting a king bed and a wood-burning fireplace, this cabin has 3 bedrooms and 2 bathrooms and can sleep up to 6 people. Named after the apple tree that hovers above the cabin, our coziest cabin at 500 square feet offers 2 beds and 1 bath. A short walk to both the playground and the fishing pond, the A-Frame structure is an intimate retreat for a couple or small family. Take a dip in the hot tub on the covered porch, or enjoy a meal on the nearby picnic table. Take the hassle out of camping, and experience “glamping”— or as we like to call it, “boutique camping”— in our brand-new canvas bell tents. Each tent sits on our shared campground beneath towering trees and is bordered by a spectacular rock face. Walk along the crystal clear winding stream, take a swim in the small swimming hole, or listen to the water babbling right from your bed. Mingle with friends around the bonfire in our 9-foot-wide fire pit under a canopy of 60-foot-tall evergreens and the warm glow of string lights. Each tent features a queen size bed with luxurious bedding, vintage rugs, and handpicked furniture. Situated on 55 acres, surrounded by rock walls, pine trees, and waterfalls, Crockett’s Run is the premier Hocking Hills wedding destination. From intimate celebrations to 500+ guest receptions, Crockett’s Run offers spectacular natural surroundings that creates the ideal backdrop for your special day. Whether you are seeking a venue for a corporate event, a family reunion, a yoga or church retreat, Crockett’s run will make your vision come true. Our state of the art event center is walking distance from all of our cabins, and offers many amenities for your guests. Go for a morning nature walk on our private hiking trail, enjoy lunch on our outdoor deck overlooking the rolling hills, or savor the views with a private bonfire in the gorge in the evening.